If the new Star Trek series reminds us of anything, it is the desperate need we have for transporters. Those are the sci-fi devices that let you literally beam yourself from one place to another. That would essentially wipe out the airline industry, which might not be a bad thing. But the other huge benefit with a transporter is that you beam out all your scary rubbish. Just press a few buttons and all your unwanted clutter will be transported to parts unknown. That would be nice. But until science gets that transporter beam up and running, we have to depend on more conventional means. The best way to get rid of rubbish today remains Junk King Orange County. 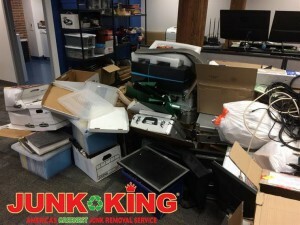 The majority of Junk King Orange County customers are pleasantly surprised at how quickly these professional junk haulers operate. That begins with scheduling. You’ll find a very prompt response whether you call in for your appointment or book it online. Most junk removal sessions are completed by the next day. There are some customers who call at the right moment and can benefit from a same day appointment. All of this means that you need to be ready when you call Junk King because they’re going to be ready for you. The final list of what you’re turning over to Junk King doesn’t have to be locked down until the crew arrives for the scheduled appointment. That should give you plenty of time to go through your closets, garage and other storage areas to tag the things you want taken away. Actually, you can literally tag those items because the Junk King crew is going to pick everything up right from where it is at. You don’t need to lift a thing. The Junk King crews have been trained to identify those items that could be donated to local charities. These organizations don’t care what shape the thing is in or how old it might be. They’ll be able to refurbish anything. That should make you feel good about tossing out sofas, bedroom sets and children’s furniture. It won’t go to waste. When you are ready to get rid of all your scary rubbish, Junk King Orange County will be ready to get the job done. This entry was posted in OC Junk Removal and tagged junk, Junk King, junk removal, rubbish on November 2, 2017 by Junk King. Last updated November 2, 2017 .